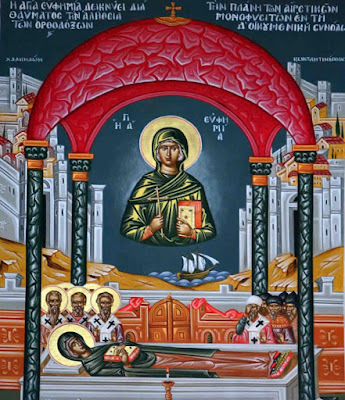 On the eleventh of this month [July], we commemorate the Holy Great Martyr and All-Praised Euphemia, when she held the Tome of the Definition of the Faith of the Six-Hundred and Thirty God-bearing Fathers gathered in Chalcedon for the Fourth Ecumenical Synod. Proclaiming the faith for which she contested with longing. Was affirmed by Eutyches to be an apparition so he was deposed. On the eleventh the definition was wondrously and firmly set by Euphemia. The Holy and Gloriously Triumphant Martyr Euphemia flourished during the reign of Diocletian (284-305) when Priscus was proconsul of Rome in the year 288. She was from Chalcedon, the daughter of her father whose name was Philophronos, and her mother was Theodosiani. Having been accused for confessing Christ, she was punished with wheels and fire, as well as with other instruments and ways of torture. After this she was given to be devoured by wild beasts, but she remained unharmed by them. When she had been slightly bitten by a bear, and prayed, she delivered her soul into the hands of God within the theater. Her honorable relic was placed in a box. More can be read in her Synaxarion on the sixteenth of September. Over the course of many years, when piety had spread throughout the world, then the following tremendous incident took place during the reign of Theodosios the Younger (402-450). A Monk and Priest whose name was Eutyches became the leader of a heresy. The deranged one said that our Lord Jesus Christ had only one nature, namely the divine, and only the one energy of His divinity. For this he was deposed by Patriarch Flavian of Constantinople. The unfortunate Eutyches used as his instruments even the unbelieving royal eunuchs, and he did not cease disturbing the Church, and he labored in his works until Emperor Theodosios died. When Marcian reigned together with Pulcheria, he ordered for an Ecumenical Synod to take place in Chalcedon in the year 451. Thus six-hundred and thirty Bishops gathered together. They wrote down both positions, the Orthodox and the cacodox Monophysite, in two tomes, namely books. And opening the box in which was the honorable relic of Saint Euphemia, they placed both books on her chest and shut it. Then after a determined amount of days they opened it, and what they saw astonished them. 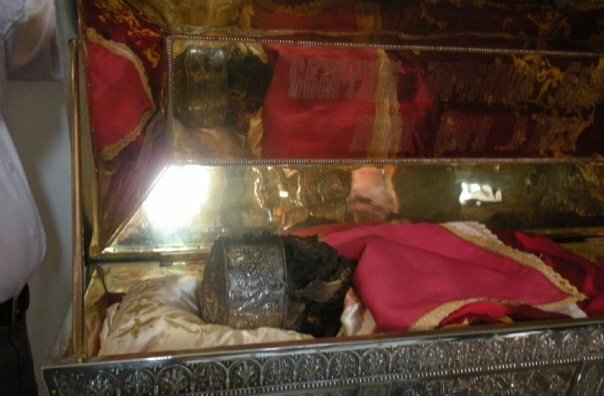 They saw the heretical tome cast towards the ground below the feet of the Saint, and the Orthodox tome, which contained the definition and decision of the Holy Synod, they saw the Martyr holding it in her embrace. When this took place, everyone marveled at this tremendous incident. And the Orthodox were made firm in their faith and glorified God, who daily does great and paradoxical things in order to cause the return and correction of many. The heretical Monophysites were put to shame. 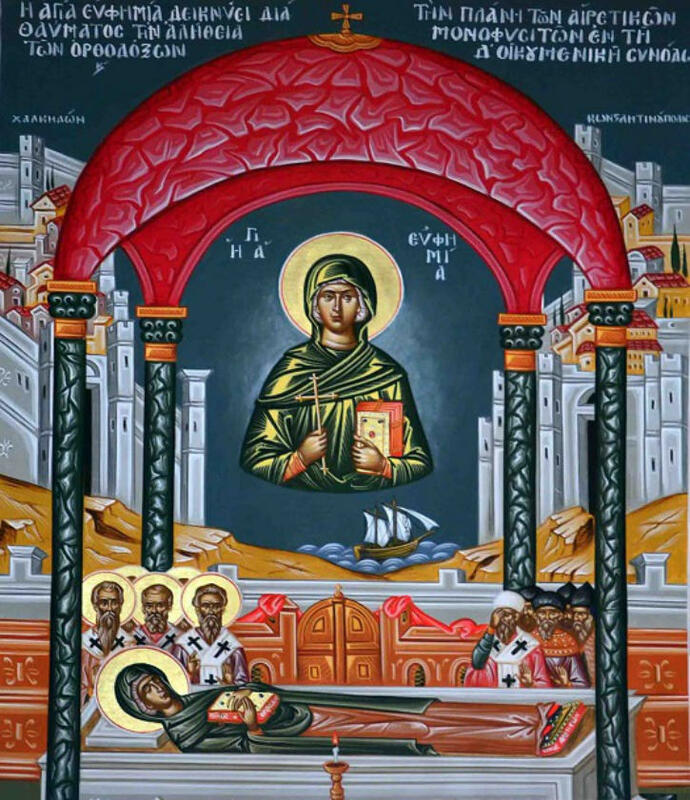 The Synaxis and Feast of this Saint Euphemia is celebrated in her martyric Temple, which is in the so-called Antiochus [the Hippodrome], near Lauson. O Euphemia, thou didst gladden the Orthodox, and put the heretics to shame. Thou didst confirm the Fathers' teaching at the Fourth Synod. O glorious Martyr, entreat Christ our God to grant us His great mercy. Thou didst struggle in faith and suffering for Christ thy Bridegroom. Now, through the Mother of God, pray that the Orthodox may overthrow heresies, O all-famed Euphemia, who didst receive and guard the definition of the six hundred and thirty God-bearing Fathers.